A mutual friend recommended Oscar to me. I initially invited him to participate in this project over E-mail and then we later chatted in person to set up the interview. He took a little convincing as he was surprised at the idea and didn't think of himself as worthy. This project is intended to spread positivity and, as you'll read below, Oscar is working very hard to do his part. His deep care for his fellow Latinos is very obvious. 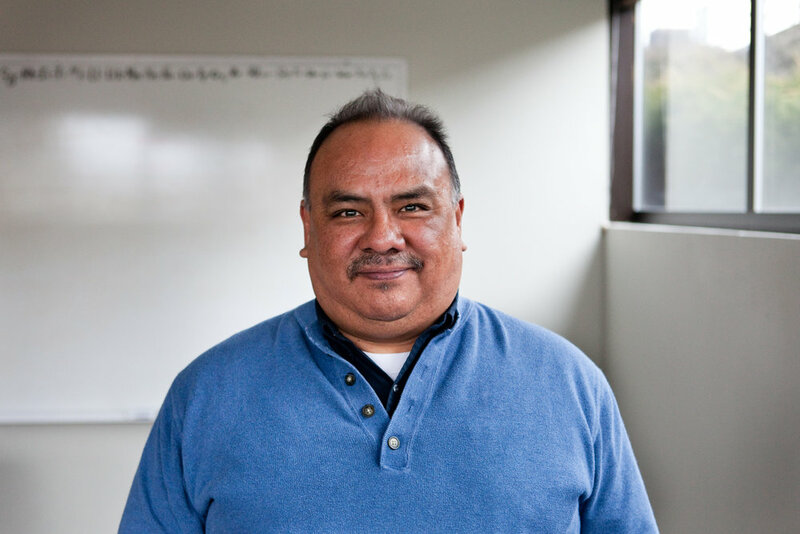 He serves as the Empowerment Programs Manager at the Latino Community Association. I am Oscar Jesus Gonzalez. And I am from Nuevo Leon, Mexico. When I was four years old I was brought over to South Chicago. My parents had were part of a huge contingent of Mexican steel workers that were brought over by US Steel and Bethlehem Steel back in the 40s and 50s. This is why South Chicago to this day is the second largest Mexican community behind Los Angeles. It was interesting to start of living in there - in the snow and cold. Unfortunately that didn't mix with little Oscarito and my parents courageously decided to move to the west coast. In the 60s we moved from place to place to avoid increasingly popular criminal activity and gang activity and they didn't wall me falling into the wrong ranks with other boys in the neighborhood. They found a small community just southeast of East L.A. called Cudahy. When we moved onto that block we were the second Mexican family on that block. This was 1966 - I was a second-grader. That was a tough transition, given that there were very few brown kids in the neighborhood. We were challenged. Sometimes we had to defend ourselves, myself and my sister. I had a best friend named Leo who could do no wrong. He was the best athlete, he was the fastest runner. He was voracious and bold and he was just a born leader. And I was his side-kick. I was a chubby guy, kind of uncoordinated, not as swift on my feet. But over time, that changed. We spent time on the baseball fields and basketball courts and later the football fields and that's what really kept us out of trouble. Eventually the gang element took over. I was beginning to have some issues, so my parents felt compelled to rescue me and put me into St. Gertrude's Elementary School in the 6th grade. I protested, but it didn't matter. My parents had made up their minds. Looking back, it was the best damn thing they ever did for me. The nuns were very impactful and significant during my formative years - from 11 to 14 - as I transitioned into high school. I had become a pretty decent football player and happened to go to a parochial high school in Downing, California, that was part of the best high school football league in California and maybe the nation. I transferred to a different high school to play football with my best friend, Leo, who had become the quarterback of their high-ranking varsity team. I knew I wanted to go to university, but that high school didn't have the advanced placement classes that I needed. I ended up transferring back to my previous high school with the help of a teacher. I was able to go to a community college in the evenings and that was the first time I ever took a Chicano Studies class. That opened up my mind. I ended up going to Loyola Marymount University and my parents were so, so, so happy (laughs) that I decided to stay within the Catholic family and would be coming home just about every weekend. I started taking more Chicano Studies classes and going to MEChA (Chicano Student Movement) meetings. They were politically charged at the time. There were a lot of things going on that I really wasn't aware of. But it really helped me to come to terms with who I was as an individual. Up until that point my whole life's focus was football, surfing, rock-n-roll, and girls, basically. At 19, being exposed to a different perspective of history, of psychology, of all the social sciences, just totally blew my mind wide open. I came to the realization that I hadn't been told the whole story. I ended up with a degree in International Political Economy with a minor in Chicano Studies with a vision to go on to law school. After I graduated from Loyola, I ended up teaching and coaching at my old high school. At the end of that first year, I went to Monterrey to live with my relatives and I studied Spanish at the Universidad de Monterrey in Mexico. When I came back, I worked as a law clerk at a firm in Los Angeles. While doing that I met a woman who would become my wife. I was supposed to start law school that fall. We got pregnant and married three months into my first year of law school. Our first daughter was born as a six-month, premature two-pounder. She had to remain in the hospital for two and a half months. She's now very successful and is one of the top administrators for Teach for America in Manhattan. I'm very proud of all my three daughters. I took a leave of absence from law school because we got pregnant again. In the meantime, my sister had moved to Houston, and I helped her get through a serious case with Child Protective Services and the Department of Human Services. At the end of a year of working with her through that, her case manager asked me if had ever thought about working in Social Services because they were looking for bilingual investigators. This was in 1988. I was about 28 years old. It sounded like a good deal, not a lot of money, but a steady job for a young father. So that was my segue into Social Services. So it's going to be 30 years, which is incredible. My wife and I ended up divorcing after 25 years of marriage. And, later, what brought me to Oregon was love. That was in 2011. An old high school sweetheart was living on the coast, so we reunited. But that only lasted about six months. We figured out early that we weren't teenagers anymore. One of my mentors in Eugene was quick to remind that a blonde-haired, blue-eyed beauty got me to Oregon but I came here for a bigger purpose. I lived in Salem and Newport and Albany and eventually ended up in Eugene for a few years. I couldn't find steady, full-time work which made it difficult to lay down roots. A posting came out for a full-time position with the Latino Community Association here in Bend and when I read it I felt it pretty much mirrored my entire career of over 30 years in terms of what I had done as a counselor, as a teacher, as a program director, as an athletic director, as a coach. I was offered the position and came out to this side of the Cascades. The difference is like night and day. This has been so remarkably beautiful and different. The fact that the sun comes out almost daily, regardless as to how the day may start up or end up. I truly feel this has some sort of effect on people's persona and outlook and feelings. And I've become a huge craft beer fan. I didn't drink when I was a father, living in Texas. Coming out here, I've acquired or developed a taste for fine craft beer. I enjoy that and I enjoy music and I think Bend has a wonderful opportunity for those of us that indulge (laughs) in such activities. I feel comfortable and I feel very welcome wherever I go. People are just really happy to live here. Despite the tough economy. Despite the depressed wages that still inflict central Oregon. I've heard of the term poverty with a view and I guess I'm there. I'm not where I was at when I was working in Houston for twenty plus years, making more than twice as much as I make now. But, you know, my life has changed since my daughters have all grown up and graduated from great colleges and universities. I'm very proud of that because of the fact that I am an immigrant. I'm a first generation American and navigated those tough waters and came out of it ahead. I only wish upon all Latino, Spanish-speaking, all immigrant families to realize their American dream. I personally believe that is still out there. It's hard to overcome those obstacles, but I don't think it's impossible. I grew up in the city where we played on concrete. Grass was at a minimum. If we wanted water, we went to the riverbed. That's where we would ride our bikes and hang out. I talk to local kids about appreciating all the trees and the fact that there is mostly blue sky here. The beauty of it - the different terrain and the river running through the city. It's just majestic. I grew up under the freeways in L.A. We were in neighborhoods that people just drove over to get to Santa Monica or Hollywood or wherever they were going. They weren't necessarily going to our neighborhoods. Having said that, there are pockets of Bend that kind of remind me of parts of Houston or even parts of L.A. where the housing has been dilapidated. I don't know if it's a landlord issue or what. But a lot of our local latino families reside in trailer parks, living in squalor. It kind of troubles me. When so many folks are living in those congested conditions it breeds all kinds of other issues. This is kind of a microcosm of a bigger urban setting. I only wish that more of Bend would know that certain pockets of Bend still leave a lot to be desired in that respect. Overall, it's beautiful. It's wonderful. I'm always looking out and trying to have a voice for the underdog, for the folks that don't have much say-so or power or leverage. I'm trying to step up and be part of the solution. I would like to see some sort of rent control imposed. Working class and, to a certain degree, middle class folks aren't able to afford to live in the community they grew up in. Let alone other folks coming in, like myself, for employment reasons or what have you are barely making it because rent is so prohibitively high. And beyond that, the occupancy rate is very, very low. It's a double-whammy. It's very competitive. I ran into it when I first moved here. I have been able to deal with it, but I look at some other families who may not speak English as well or may not have the proper documentation, and wonder how it is that they are able to navigate those troubled waters. I ponder about these things. Through our Community English Tutoring program, we are able to connect folks living in Bend to our Latino citizens to help them learn English or improve their computer skills or help them become citizens of the United States. That gives me a lot of hope. For the most part, our neighbors here in Bend are welcoming and are open to diversity and are tolerant and understand that with diversity comes newness and freshness. It makes all of us that much more interesting to each other. When I was a kid, Latinos were about 10% of the population in California, but now we are the majority there. In my lifetime, everything has changed. And I foresee that happening here, too. I look forward to building community amongst all folks, regardless of your background, your culture, your language, or your religion. In this political climate, it is challenging. Our leaders in government are espousing ideas that aren't as embracing or tolerant as we all need to be. Many of our folks, as a result, are very afraid for themselves and their children of the possibility of being deported and having their family being torn apart. That's a horrific thing. There's nothing tougher. I hope it doesn't come to that, but we are preparing ourselves for the worst. We are always on the lookout to recruit other folks who are not Latinos, who are non-Spanish speakers, but have a concern and also want to be part of the solution and not just stand by and allow things to fester. These are folks who come in and ally with us and become our tutors and develop relationships with our clients and families. Initially it's a teacher-student relationship, but it evolves very quickly into a mentor relationship and blossoms into a true friendship. That's a really beautiful thing. I really believe that education, at the end of the day, is the key. I am troubled by the amount of kids who are leaving school before finishing. And by the fact that very few of our students are going directly to a four-year university. If they are lucky, they'll end up at a community college. And from there, I'm not sure how many are actually getting certificates or degrees. We are trying to make a difference here.